We are ALL over the map with this batch of books. 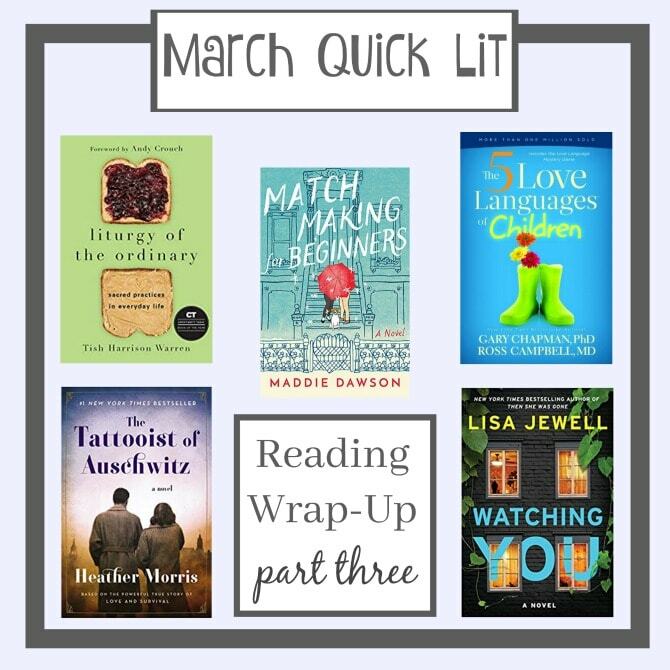 If a diverse reading life makes for a happy reading life, then this post is proof that I am the happiest of readers! 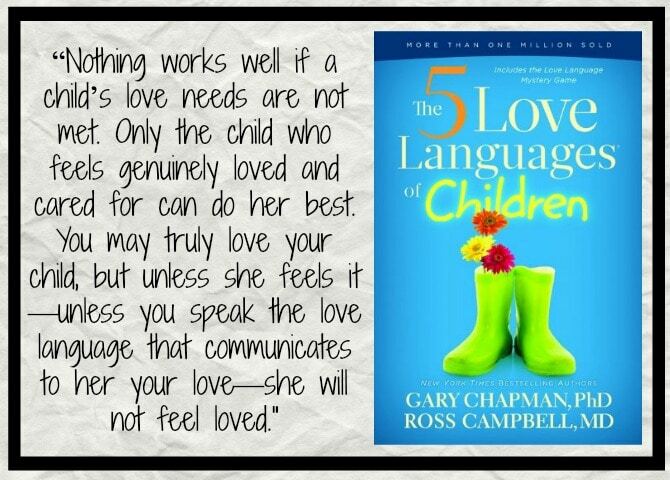 The 5 Love Languages of Children, by Gary Chapman and Ross Campbell: I’m a longtime believer in the concept of the 5 love languages, and Dr. Chapman’s original book is one of my favorite relationship books to recommend. Lately I had been thinking about how the love languages concept could apply to my relationship with Charleston and decided to check out this book for more insight. The book begins as one would expect, with an introduction to the 5 love languages (Physical Touch, Quality Time, Words of Affirmation, Acts of Service, and Gifts), accompanied by stories of kids who “speak” each love language. The authors go beyond the what and how of the languages to explain the why behind each one. Their specific ideas for implementing each love language are creative and useful, and I have begun trying many of them out on Charleston to help fill up his little love tank. Part of their advice includes some important precautions to take as we grow comfortable speaking “new” languages; many of these precautions wouldn’t have occurred to me and were the most helpful information in the book. After the preliminary chapters dedicated to the specific love languages, the book contains chapters on how to determine your child’s love language (I’m fairly certain Charleston has two: Gifts and Physical Touch); how to adjust your discipline tactics to better align with your child’s love language (this was the most interesting and useful chapter); balancing love and anger; and the correlation between learning and love languages. The book also includes information on how single-parent families can make special use of the love languages in their unique situations. The book ends with a recap of the original Love Languages book, with advice on how couples can improve their relationship—and become more effective parents—by learning to speak one another’s love languages. Since I’ve followed Dr. Chapman’s work for some time, I wasn’t surprised that much of this information was familiar. Still, this is a very useful guide with some excellent parenting advice and quite a few unique new concepts to consider. 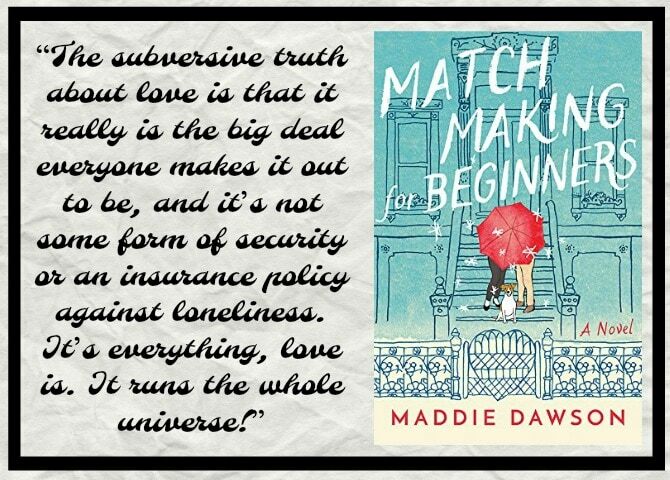 Matchmaking for Beginners, by Maddie Dawson: Though Marnie MacGraw has always been a bit eccentric, she longs for a normal life: a husband, kids, a home in the suburbs—comfortable and quiet, small but quite happy. Her plans go awry when her dreamboat husband asks for a divorce just two weeks after their wedding day. Marnie moves back home with her parents in Jacksonville, Florida, but the situation grows complicated when Marnie discovers that she has inherited a Brooklyn brownstone from her ex’s quirky, matchmaking great-aunt, Blix, whom Marnie has only met a couple of times. As part of the inheritance, Marnie must live in Brooklyn for three months before she has the option of selling the home she doesn’t need or want. So, against her family’s wishes, Marnie leaves what is looking to be a promising future in her home town for three months in Brooklyn. While in New York, Marnie “inherits” several projects from Blix (an amateur witch): there’s the disillusioned divorced woman and her son who share Blix’s building; the widow next-door for whom a second chance at love is within reach; and Patrick, the brokenhearted burn victim who lives in the basement, determined to live life as a recluse despite the great plans Blix—and now Marnie—have for his life. This isn’t a book I would have picked up on my own if it hadn’t been recommended by a MOPS friend as our next book club selection. I am SO glad for the nudge to read this, because it was a pure delight. The story is much deeper than its premise would suggest, touching on themes of happiness, broken hearts, and what it means to choose a Big Life over an ordinary one. The characters are endearing; I particularly adored both Marnie and Blix and their humorous, unexpected narration. The dialogue (especially the conversations done through text messaging) are snappy, while some of the prose was so deep and thought-provoking that I had to pause for a while just to absorb what I was reading. Magic realism and mysticism play a rather significant role in the story, and while it is a bit strange, I found it to be a good fit for the book’s kooky setup and oddball characters. This is such a great feel-good novel that had me smiling the whole way through. Watching You, by Lisa Jewell: Joey Mullen has led a fairly wild life, but now, in her twenties, she thinks she’s ready to settle down. She’s just returned from working at a resort in Ibiza, accompanied by a handsome new husband, Alfie, whom she hardly knows. Without jobs or a home, Joey and Alfie find themselves living with her beloved older brother and his pregnant wife in Melville Heights, one of the nicest neighborhoods in Bristol, England. Joey quickly becomes infatuated with Tom Fitzwilliam, their middle-aged neighbor who is a highly regarded headmaster at the local school. Not everyone is so smitten with Mr. Fitzwilliam. One of his students, Jenna Tripp, has reason to believe that the headmaster’s interactions with his female students have been less than honorable—a belief fueled by Jenna’s paranoid mother, who is certain that Tom Fitzwilliam is stalking her. Meanwhile, Tom’s adolescent son, Freddie, is doing some stalking of his own and has observed some very suspicious behavior in the neighborhood and especially within his own house. There is a lot going on in this book. The novel bounces between the perspectives of Jenna, Joey, and Freddie, with their stories overlapping in some intriguing ways while also bringing in additional storylines and characters. For the first third of the novel, I was fairly confused by the various plot threads and frustrated with the numerous dislikable characters. However, Lisa Jewell’s past novels have taught me to trust her process, and I was not disappointed. The stories did eventually come together and I grew to understand and even like many of the characters as their backstories and motives were revealed. Watching You is filled with surprises, nuanced characters, and intriguing explorations of identity, mental illness, and false impressions. The neighborhood setting is a unique one and fits well with the Rear Window-type premise, and I enjoyed the British sensibility. One again, Lisa Jewell has delivered a riveting story with some substance—my very favorite type of mystery. 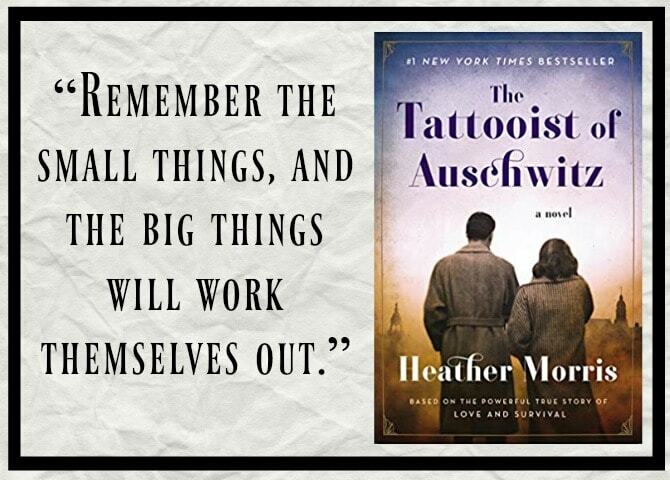 The Tattooist of Auschwitz, by Heather Morris: Based on interviews conducted with a Holocaust survivor, this is the true story of Lale Sokolov, a Slovokian Jew who is forcibly transported to the concentration camps at Auschwitz-Birkenau in April of 1942. When his captors discover that Lale can speak several languages, he is given the job of camp tattooist and charged with marking his fellow prisoners. During his time in the camps, Lale is exposed to the worst of atrocities but also witnesses (and is the occasional recipient of) incredible acts of compassion, kindness, and sacrifice. As a prisoner with privileges, Lale risks his own life to provide extra food to keep fellow prisoners alive. Through it all, Lale is determined to survive and make a life with Gita, a young prisoner who captured his heart from the first time he saw her. Though he knows little about Gita, their love is a lifeline and a light for each of them in this place of death and darkness. I lost interest in WWII stories a long time ago—not because they are not interesting and desperately needing to be told, but because I can only stomach so much torture, death, and depravity. That said, The Tattooist of Auschwitz had been showing up everywhere lately and I knew it was one I should read (albeit reluctantly). I can see why this book has garnered so much attention. Lale’s story is tragic yet inspiring, made especially compelling because it is true. Given the subject matter, there is quite a bit of cringe-worthy content, but none felt gratuitous, which I appreciated. While this book receives full marks from me for story and heart, I wasn’t impressed with the writing. The prose and dialogue are straightforward and sterile, and the author glosses over the emotional and moral complexities that are present, but barely explored. With such powerful content to work with, I wish the author had delivered a more engaging read. 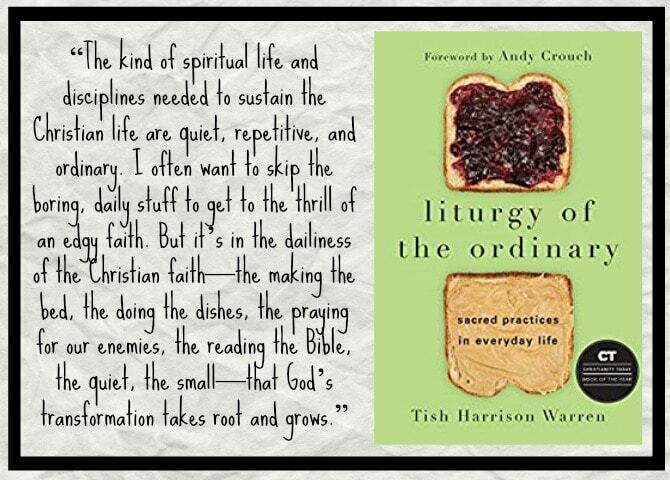 Liturgy of the Ordinary, by Tish Harrison Warren: It’s easy for me to worship God at church, or when I’m reading my Bible, or participating in a service activity. It’s harder for me to acknowledge God’s presence in the quotidian moments of daily life. They feel too mundane, too routine, too corporeal to be considered sacred. In Liturgy of the Ordinary, Anglican priest Tish Harrison Warren reminds readers that God is just as present in our everyday moments as when we are sitting in a church pew. Framed around elements of an ordinary day (making the bed, waiting in traffic, eating a bowl of soup, checking email), the book explores daily life through a liturgical lens, modeling how these routine activities can become sacred acts of worship. Warren’s message of slow, still, and prosaic goes against culture’s love of distractedness and impact. She reminds us that God calls us to obedience, presence, and faithfulness in EVERY moment—including the small, forgettable ones. Warren helped me understand why this attitude is important and gave me some practical suggestions for approaching my own day-to-day life with sacred awareness. I’m not Anglican, but this book almost had me wishing that I was. Although some of Warren’s theology is slightly different than mine, I see so much value in her perspective. And while I had excellent takeaways from every chapter, Warren’s thoughts on vocation, confession and congregation hit closest to to home. What’s the best (or worst) book you’ve read lately? Let me know about it in the comments!